Shopify Plus is an award winning cloud-based enterprise e-commerce platform for high volume merchants. In our test of popular ecommerce solutions it got the highest score and was distinguished with our Great User Experience Award for 2017. It offers enterprise-grade selling capabilities without the huge price tag and hassles of traditional enterprise solutions. Many large brands and fast growing companies use Shopify Plus to boost their business. Shopify offers a highly distributed, multi-tenant platform that processes billions of dollars a year. This platform reduces IT expenses and with it you don’t have to worry about transaction fees, rack space, or bandwidth. Shopify Plus makes it simple to sell your products on all major marketplaces and social networks. Its multichannel capabilities boost customer engagement, improve sales, and increase brand awareness across any channel you choose. 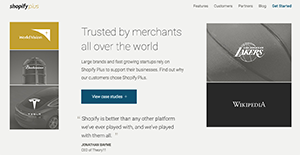 The vendor’s expert team of account managers, dedicated support agents, and technical designers make transition to Shopify Plus smooth and fast. Shopify’s highly scalable SaaS platform assures 99.97% uptime for your website and gives your visitors a fast and enjoyable experience. The SaaS model reduces your IT hardware and manpower costs, meaning you can concentrate on your business, rather than IT. Shopify Plus can handle thousands of orders per minute with ease. With Shopify Plus, there’s no limit to your sales volume, the bandwidth you require, or the number of products you can sell. You can sell online, in-store and through any channel you wish. It’s possible to accept payments from Bitcoin, PayPal, and more than 70 other payment gateways. You can sell in multiple regions and in different languages. Plus, you can negotiate credit card rates by accepting payments directly with Shopify Plus. Shopify Plus is certified Level 1 PCI DSS compliant, and uses continuous risk management and annual on-site compliance. Shopify Plus offers responsive designs for any brand and any screen. The software gives you complete control over the feel and look of your website. You can define your layout, branding, and content in any way you like. The fully responsive platform allows you to create beautiful customer experiences that work on any screen and any platform. Shopify Plus’ advanced reporting and analytics features, boosted by Google’s Enhanced Ecommerce Analytics engine, help online retailers get deep insights and understand customers better. You can use Shopify Plus’ ready-to-go app integrations with Ordoro, Brightpearl, Stitch Labs, and Channel Advisor, or create custom apps to link your sales channels. It’s also possible to use the software’s open APIs to perfectly fit your e-commerce presence with your current multichannel operation. Shipwire, Webgistix, and Fulfillment by Amazon are already built in for Shopify Plus customers. You can also use the robust API to create a custom fulfillment app to connect to other solutions you use. The vendor’s large network of servers located around the world ensures your customers can load your online store at fast speeds wherever they are. Shopify Plus offers dedicated account management and support to help you improve your online store. You can instantly access 24/7 priority support through phone and email. If you are considering Shopify Plus it may also be a good idea to check out other subcategories of Best eCommerce Software listed in our database of B2B software reviews. Each company is different, and may call for a special eCommerce Software solution that will be designed for their company size, type of clients and staff and even specific niche they cater to. You should not count on finding a perfect services that is going to be suitable for each company regardless of their history is. It may be a good idea to read a few Shopify Plus reviews first and even then you should keep in mind what the software is intended to do for your company and your employees. Do you need a simple and intuitive solution with just basic features? Will you really use the complex functionalities required by pros and large enterprises? Are there any specific tools that are especially practical for the industry you operate in? If you ask yourself these questions it will be much easier to find a solid app that will fit your budget. We realize that when you make a decision to buy Shopping Cart Software it’s important not only to see how experts evaluate it in their reviews, but also to find out if the real people and companies that buy it are actually satisfied with the product. That’s why we’ve created our behavior-based Customer Satisfaction Algorithm™ that gathers customer reviews, comments and Shopify Plus reviews across a wide range of social media sites. The data is then presented in an easy to digest form showing how many people had positive and negative experience with Shopify Plus. With that information at hand you should be equipped to make an informed buying decision that you won’t regret. What are Shopify Plus pricing details? What integrations are available for Shopify Plus? If you need more information about Shopify Plus or you simply have a question let us know what you need and we’ll forward your request directly to the vendor.